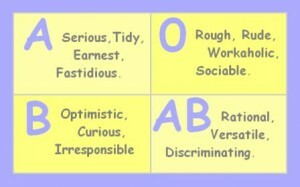 Many Japanese people believe that one’s blood type relates to the personality. Almost everyone knows his/her blood type and also has the idea of which blood type has what personality (see the chart). People often talk about blood types in their conversation, or guess others’ blood types. Blood types are often mentioned in casual self- introductions and in profiles of idols or manga characters!